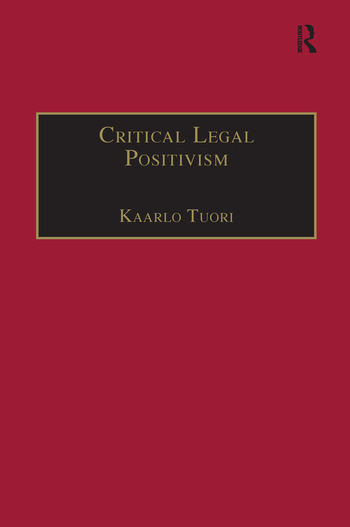 This profound and scholarly treatise develops a critical version of legal positivism as the basis for modern legal scholarship. Departing from the formalism of Hart and Kelsen and blending the European tradition of Weber, Habermas and Foucault with the Anglo-American contributions of Dworkin and MacCormick, Tuori presents the normative and practical faces of law as a multilayered phenomenon within which there is an important role for critical legal dogmatics in furthering law's self-understanding and coherence. Its themes also resonate with importance for the development of the European legal system. Contents: Introduction: Modern law and its problems. Three Narratives of Modern Law: Max Weber: the formal rationality of modern law; Francois Ewald: the rationality of the norm; JÃ¼rgen Habermas: the communicative rationality of law. The Aspects and the Levels of the Law: The two faces of the law; The levels of the law; The formation of the legal order: the relations of sedimentation and constitution; The self-limitation of the law; The legitimacy of modern law; Legal science; Bibliography; Index.